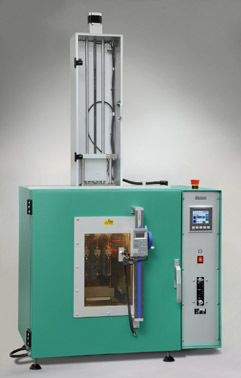 This Hot Set Tester offers standard conditions for performing hot set tests on cable sheat material according to IEC 811-2-1. The flow meter controlled air exchange rate and low air speed, meet the requirements for ageing ovens as specified in the standard IEC 811. Measurements are done with a laser pointer mounted on a measuring scale located before the door window. The window can be taken apart for cleaning. By means of a push button, the elongation measurement values are registered and transferred to a template in Excel. The hot set value is measured outside the oven with a digital caliper and also transferred into the Excel template. The test report can then be made in Excel too. 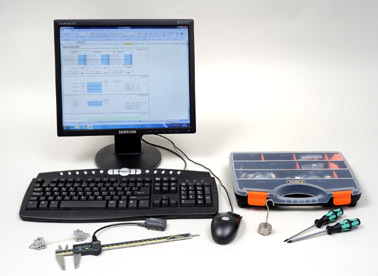 The scope of supply of the Hot Set Tester includes, the computer and clamps and weights for 8 samples. Hot Set Test from Elastocon AB on Vimeo.